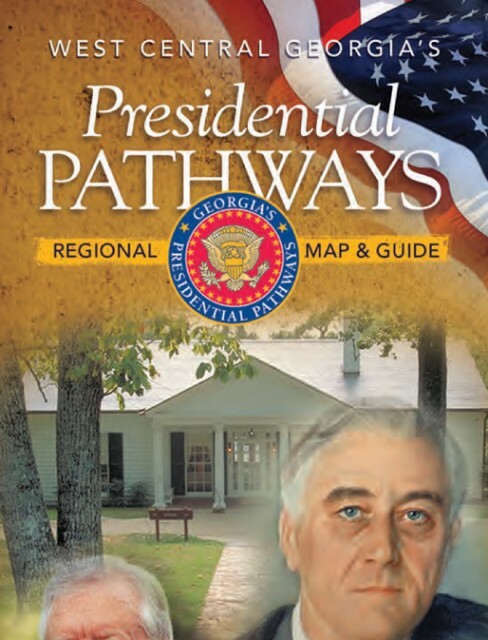 Travel to the Presidential Pathways region of West Central Georgia and experience a world of history, recreation, culture and more! Deeply rooted in American history, this travel region highlights the heritage of U.S. presidents and natural wonders. History is the thread that ties the Presidential Pathways region together and Macon County is proud to have one of the most historic stops on the tour. History buffs will enjoy the wealth of sites concentrated in this small area. Explore the lives of two American presidents, the origins of the world’s best-loved soft drink, Civil War relics, antebellum and Victorian homes, covered bridges, and much more! Families and school groups have many opportunities here to learn first-hand about various aspects of our nation's -- and this region's -- history. Andersonville National Historic Site in Macon County is the site of one of the largest of many Confederate military prisons established during the War Between the States. It was built early in 1864 and, during the 14 months the prison was in use, more than 45,000 Union soldiers were confined here. Almost 13,000 of these soldiers perished from disease, poor sanitation, starvation, overcrowding and exposure to the elements. Today, the site serves as a memorial to all American prisoners of war. An audio driving tour is available and provides specific information on the historic prison site. More than any other American president, Jimmy Carter is closely identified with his hometown. In Plains, Ga., a quiet, peaceful small town (population 716) still very much based around farming, church and community, the Jimmy Carter National Historic Site and Preservation District work to interpret the life and presidency of Jimmy Carter and to preserve the history and character of this small town. Plains High School, where both Jimmy and Rosalynn Carter attended, is the visitor center and museum for the Jimmy Carter National Historic Site. Films and exhibits depict the history of the town and the President. Another president, Franklin Delano Roosevelt, liked this region so much that he built a Little White House in Warm Springs! Visitors can trace FDR’s story -- his struggle with polio and his great task of pulling our country out of the Great Depression. The Little White House, a state historic site, is a white clapboard home that FDR built for himself in 1932 on the north slope of Pine Mountain. Throughout his presidency, FDR entertained there and used the Little White House as his retreat. While posing here for a portrait on April 12, 1945, FDR suffered a stroke and died a short while later. Today, the Unfinished Portrait is featured in a new museum that showcases many exhibits, including FDR’s 1938 Ford convertible with hand controls, his Fireside Chats playing over a 1930s radio, his stagecoach and a theater. The originator of the formula for Coca-Cola, a Columbus pharmacist, is celebrated at the Pemberton House in Columbus, his one-time home. The home features Pemberton family heirlooms as well as many Coca-Cola related items. Dr. Pemberton lived in the Greek Revival four-room cottage between 1855-1860. Horace King, a slave for half his life, earned his place in history for the scenic legacy of the more than 100 covered bridges he built throughout the region. The oldest and longest covered bridge in Georgia, credited to Horace King, is the Red Oak Covered Bridge in the town of Gay. King is buried in LaGrange, his grave marked by a headstone inscribed "Horace King Master Covered Bridge Builder." Westville, near Lumpkin, Ga., is a fascinating look into the Georgia of the 1850s. Costumed interpreters go about daily rural life as it would have been lived in the 1850s. A stop in LaGrange may lead you to experience the elegance of the historic Hills & Dales Estate, described as "Five Acres of Heaven." Once the home of textile magnate Fuller E. Callaway Sr. and opened to the public for tours in October 2004, this 35-acre estate includes Ferrell Gardens, which dates back to 1832, and consists of an elaborate blend of extensive boxwood plantings, fountains, descending terraces, a greenhouse, and more. The centerpiece is the Italian-villa style house designed by the noted architectural firm of Hentz and Reid. 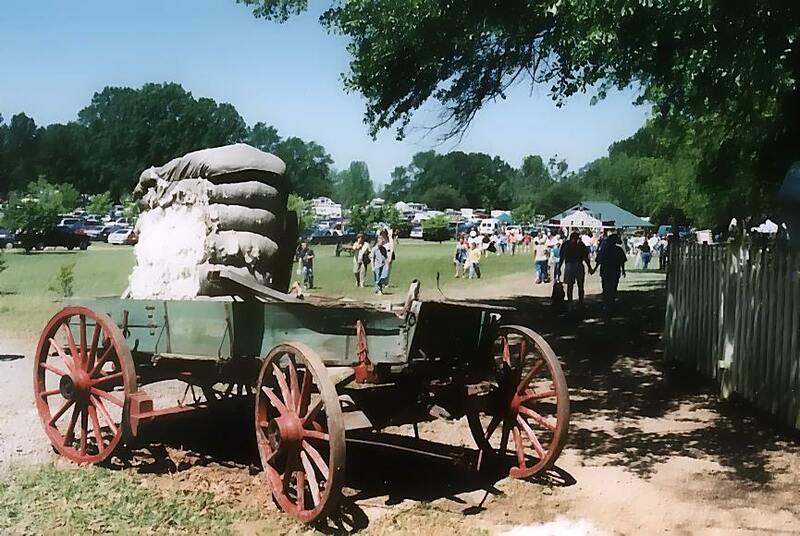 Several towns have museums that focus on early Georgia life: Leslie’s Georgia Rural Telephone Museum and Vienna’s Cotton Museum are two fine examples, as is the Port Columbus Civil War Naval Museum, the only museum dedicated to Civil War naval activity. 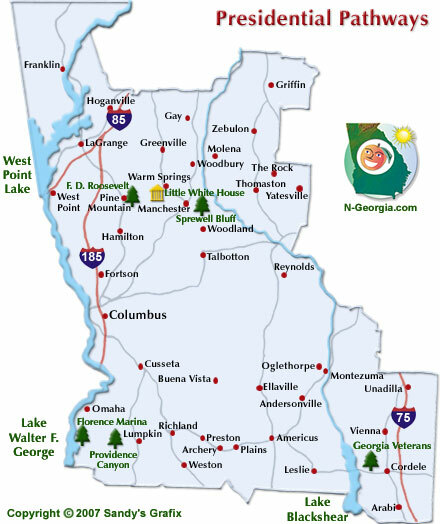 Many of the towns located in this region have beautiful historic districts featuring antebellum or Victorian architecture and main street restorations. Stop at the visitor center in most towns for a map and directions to the historic homes in the area.